BACKGROUND: Yellow toadflax is likely an escaped ornamental brought to this country from Europe. It spreads both by seed and roots. This weed contains a poisonous glucoside that may be harmful to livestock. Yellow toadflax grows under a wide range of environmental conditions. DESCRIPTION: Yellow toadflax is a perennial with narrow, nearly opposite, 2-inch long leaves. Stems are smooth, generally unbranched, and up to 3 feet tall. The showy snapdragon-like flowers are about 1 inch long (excluding the 1/2-inch spur), yellow with an orange throat and bloom from summer to fall. Seed is produced in brown, globe-shaped capsules. Seeds are round, dark colored with notched, papery collars that act as wings in spreading the seed. 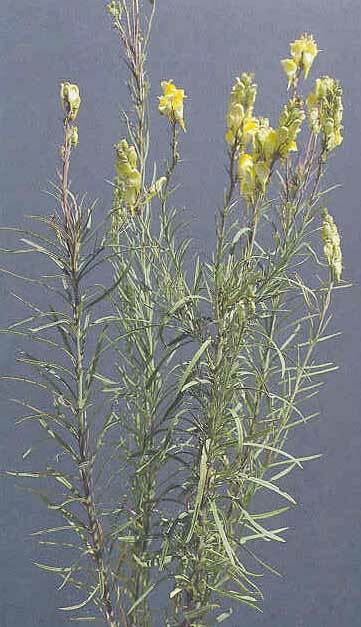 DISTRIBUTION: Yellow toadflax is found throughout the U.S. and in nearly all areas except western and south-central Idaho counties. CONTROL: Biological control agents (a defoliating moth, a seed head weevil, and a flower beetle) provide fair control of yellow toadflax. Herbicides are also available.